We’re like you – young and old, infants, adolescents, students, professionals, working people, and retirees. Some of us grew up in the Orthodox faith, most of us are new to it! We come from a variety of backgrounds, but we are united in our love for each other and our love and devotion to Jesus Christ. The Orthodox faith is the original form of Christianity, and has retained its doctrine, morality and worship ‘unreformed’ and unchanged for 2 millenia. 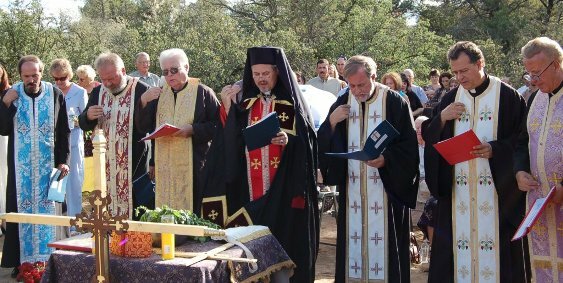 The Orthodox faith has over 300 million members today, and is rapidly growing not because of some slick ad campaign, or theology du jour, but precisely because it remains the Christian Church of the ages forever proclaiming the Gospel of Jesus Christ, and worshipping God in Spirit and in Truth. We make up the Orthodox Church in the Quad-City area, and we welcome you to join us. Click here for our schedule/calendar of events. You are welcome to all of them.